Sutton, who moved American Girl into his 609 Fifth Ave. building last year, pulled off the new 34th Street purchase and lease without any brokers. Last year, he was close to buying the former J.P. Morgan and Labels for Less building for a lower price, but didn't have an anchor tenant and decided to pass. He swung back to the deal more recently, at a higher price, with American Eagle Outfitters in tow. 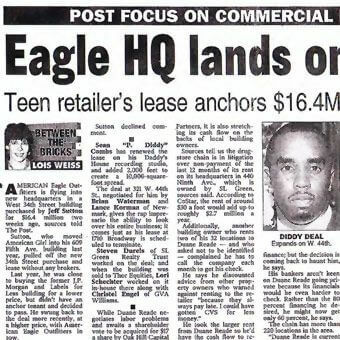 Sean "P. Diddy" Combs has renewed the lease on his Daddy's House recording studio, and added 2,000 feet to create a 10,000-square- foot spread. The deal at 321 W. 44th St., negotiated for him by Brian Waterman and Lance Korman of Newmark, gives the rap impresario the ability to look over his entire business; it comes just as his lease at 1710 Broadway is scheduled to terminate. Steven Durels of SL Green Realty Trust worked on the deal; and when the building was sold to Thor Equities, Lori Schechter worked on it in-house there along with Christel Engel of GVA Williams. While Duane Reade negotiates labor problems and awaits a shareholder vote to be acquired for $17 a share by Oak Hill Capital Partners, it is also stretching its cash flow on the backs of local building owners. Sources tell us the drugstore chain is in litigation over non-payment of the last 12 months of its rent on its headquarters in 440 Ninth Ave., which is owned by SL Green, sources said. According to CoStar, the rent of around $30 a foot would add up to roughly $2.7 million a year. He says he discounted advice from other property owners who warned against renting to the retailer "because they always pay late. I could have gotten CVS for less money." He took the larger rent from Duane Reade so he'd have the cash flow to refinance; but the decision is coming back to haunt him, he says. His bankers aren't keen on Duane Reade going private because its financials would be even harder to check. Rather than the 80 percent financing he desired, he might now get only 60 percent, he says. The chain has more than 220 locations in the area. "Duane Reade is current and timely in its rent payments to its landlords," said a spokesperson for the retailer. "Matters regarding Duane Reade withholding rent for breaches of leases by landlords are generally the subject of litigation which predates any announced transaction and are not related in any way to Duane Reade's financial condition." SL Green did not comment before press time. The 2-year-old Museum of Comic and Cartoon Art, now located at 32 Union Square East, is moving to 2,500 square feet at 594 Broadway and expanding its programming. The nonprofit art and educational museum is dedicated to the study and preservation of cartoon art. Its new building owner, Jeffrey Gural of Newmark, is also on the museum's board of advisers and gave it a break in the rent. Netherlands-based "extreme jean" clothier G Star Raw is opening its first U.S. store at the crossroads of SoHo and NoLIta, at 63 Prince St.
Joel Isaacs of Isaacs & Co. brought the company to the location, which was repped by the leasing team of Faith Hope Consolo and Joseph Aquino of Garrick-Aug. The 10-year lease for about 4,300 square feet includes 2,700 square feet on the ground, a 300-square-foot mezzanine and a selling basement of 1,300 square feet. Previous retailer Roots pulled out. Owner Jimmy Elmemeh has a current store at 132 Thompson St. that offers holistic vet seminars and pet psychics; G Star Raw's latest collections include fashion for pets. Later this spring, Elmemeh plans to create a total pet lifestyle center in 5,000 square feet at 177 West Broadway, which was previously the store Whimsy Blue. Elmemeh will load up the 2,300 square feet with such goodies as clothing, organic foods, pet accessories and designer skateboards. The asking rent was $85 a foot. The five-year deal for the two-level store was negotiated by Elmemeh's rep, Cynthia Chapin of the Lansco Corp., with the owner's rep, Sarah Cassell of Chodosh Realty. Aerosoles, the queen of comfy-shoe companies, has leased a new store at 12 E. 14th St.
Steve Tarter, of Tarter Stats, repped the building, where asking rents were $150. Jason Pruger of Newmark New Spectrum brought Aerosoles to this block near Union Square. Pruger also repped Aerosoles for a 1,700-square-foot Rockefeller Center space, which consists of a portion of the former Chez Louis space at 1250 Sixth Ave.
Kim McCullough of KEM Company helped Pruger on the transaction, while Donna Blair of Tishman Speyer worked in-house for the company that owns Rockefeller Center.